Miss Lockie and Mrs Taylor are the full time Art and Photography teachers at Dormston, Mrs Beer, as head of the Arts, also teaches Art. We offer training in a wide range of 2D, 3D and digital media. 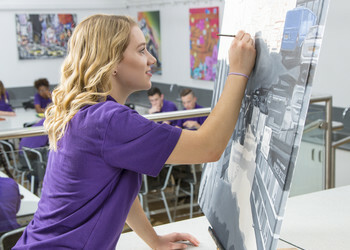 We believe that you can express yourself, get to know the world and teach others by being creative, developing your visual communication and practical skills. We envision a future for the department, and school, where Art and Photography skills enrich peoples’ lives and ideas. We understand how transferable these skills are to other aspects of learning. Throughout the year there are opportunities to enter Art and Photography competitions and accept workshop invitations for Art or Photography. Additionally there are KS4 revision and catch up sessions booked throughout the year. Introduction to the formal elements of Art and Photography. Development of practical accuracy and skill in a range of 2d and 2d media. Introduction on how to research, analyse and be inspired by Artists and wider cultural sources. Development of a personal response to themes. Pupils are assessed against the GCSE assessment criteria. Winners of the Photography competition this year had their work exhibited at The Portal Gallery which we then had the privilege of a private viewing. We have had a visiting photographer to introduce analogue and darkroom photography to KS4 which we hope to introduce to this years’ new photography pupils. We plan to introduce more visiting artists, photographers and trips this year.